Sotha Sil's designation of this mountaintop laboratory as the "Orbservatory Prior" clearly indicates that the site was an experimental or test version of what he had in mind—though whether he ever built an "Orbservatory Final" is unknown. 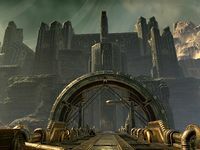 The Orbservatory Prior is a notable player house in the Clockwork City. This page was last modified on 19 November 2018, at 07:25.